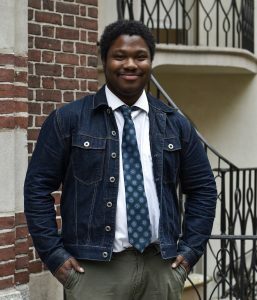 I first met Kosoko (pronounced: Koh-So-Koh) at BEA a year ago. His debut was yet to come, but there was already so much buzz around him from YA writers I knew. A PLACE FOR WOLVES has been highly anticipated with good reason. I for one can’t wait to read a historical novel that features a romance between two boys trying to survive a war conflict. Take it away, Kosoko! A Place for Wolves was not my debut, nor the book I thought would be my debut. I started writing stories when I was 6 years old—my first, about two kids who wandered into a forest and got eaten by a bear. I read it to my parents during commercial breaks of Wheel of Fortune. I dabbled in writing for about 15 years later, until, at 21, I decided to pursue writing a novel for the sake of publication. I remember writing my first novel, and my first query letters. Most writers will tell you their first novel, and query, are bad. Mine was bad. Over 800 words long, bad. And of course, all rejections. But one thing stuck out, an agent who said “This needs work, but keep going. Your voice is of value and what you’re doing has importance.” I wouldn’t be where I was without that sentence. After that I wrote three other books – A science fiction climate change dystopian, a contemporary and a science fiction thriller. A Place for Wolves, my fourth written novel, started out as a fantasy that was an allegory to the Kosovo-Serbian Conflict. An agent suggested, after reading, that the book would be stronger, actually about the conflict. Lo and behold, two and a half years after that advice, A Place For Wolves was born. And now, over 200+ agent rejections, 4 massive rewrites and roughly 20 editor rejections later, this historical thriller that centers queer boys of color, is my debut. But not only that. It’s a book that helped me accept myself as a Black man—not just a male of color—and that my voice, my existence, has power. I’ll always thank my book for that. A Place for Wolves is about James Mills, the adopted son of USAID workers who are going to Kosovo for their final humanitarian tour. It’s also the first time he’s going on a trip without his sister and support Anna Mills. Half of the book is James writing letters to his sister, where he explains how much he hates (and grows to love) Kosovo, what he’s learning, and most importantly, the romance that is blossoming between him and Tomas, the son of Brazilian engineers in country. The other half of the book focuses on our two boys struggling to survive when the war breaks out, and they have to make it from their small town in the south, all the way north to the embassy. Along the way they have to overcome Kosovo winters, Kosovo Liberation freedom fighters, and solve the mystery of James’ parents’ involvement in the war. I wrote this story because I wanted to center queer Black characters as people to love, people who can make mistakes, as heroes, as flawed characters, but most importantly, worthy of the time and attention of mainstream readers. This isn’t just a book for queer readers, or Black readers, though I did write it for them—it’s for those who love period pieces, who love action books, and who understand, or are struggling with the concepts of black and white in their life. Atonement was a huge inspiration for this book. As was Testament of Youth (the movie, not the biography), How I Live Now, Aristotle and Dante Discover the Secrets of the Universe, S.E. Hinton, and some of the great queer authors who have come before me—Shaun Davis Hutchinson, Bill Konigsberg, David Levithan, Adam Silvera and Mark Oshiro. Oh, and of course, James Baldwin. I was also inspired by Jason Bourne, and (embarrassingly enough), during edits, Ed Sheeran’s Galway Girl. 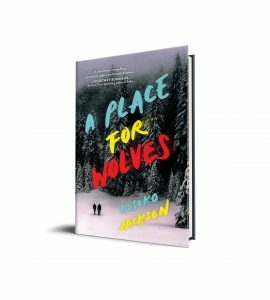 As of this publication, A Place for Wolves has received two Starred Reviews—one in School Library Journal and one in Booklist. It’s also been featured on many “top books of 2019” lists, on Barnes and Noble, Bookriot, and other outlets. Librarians have really grown to love the story and teachers have applauded how it educates but doesn’t lecture. I was also invited to ALA, ABA NCTE, North Texas Book Festival, and NOVATeen thanks to this book. I think the state of the industry is a complex beast. On one hand, publishing is a business that means to make money, but on the other, it, unlike adult books, has a responsibility to its readers to make the best, most comprehensive and accurate books possible. Does this mean book can’t have problematic content? No. Does this mean books can have bad content, or rough content? No. But blatant ignorance in order to support the bottom line, does more harm than good in the long run. For many young adults, books are their first experiences and confrontations with complex topics. For others, books are how they find themselves or process complex topics. As such, it’s important that the industry remembers who it caters to—not adults, though they do buy a large amount of children’s books—but teens. And teens deserve the best representation, advocates, and stories possible. Those aren’t always the stories that make the most money. Thank God for editors who say “keep going.” I’m sometimes a little leery of period books but this one sounds promising and unique and I can’t wait to read it.